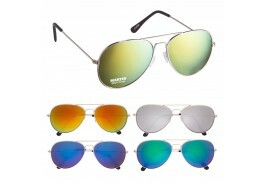 Make your event special with a pair of custom Aviator sunglasses from the Custom Sunglass Store. Aviator sunglasses, originally created to protect pilots’ eyes from the glare of the sun, are as popular today as they were in the 1950’s. Universally recognized, aviator sunglasses feature a large lens covered about three times the size of the eye with temples that hook back around the ear. Personalized aviator sunglasses make a great addition to any marketing campaign, and feature your custom logo directly on the lens in a classic, stylish way. Choose from colored mirrored, gradient or black lenses and make a big statement at your next event. 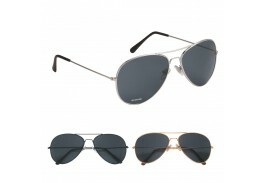 Not just for pilots, aviator sunglasses are as popular with women as they are men. 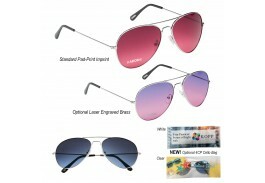 The large UV400 lenses provide 100% UVA and UVB protection and cover a larger area of the face. Customized sunglasses are a mainstay of summer promotions, so order plenty to keep you going throughout the summer and beyond! 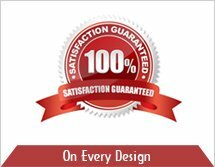 Ideal for just about any promotional event, have your custom logo imprinted on one or more colors and give them out as customer appreciation gifts, employee incentives, or as event prizes or raffles. 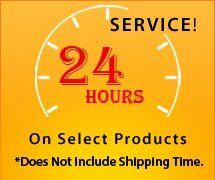 If you need help placing an order, please call us and one of our helpful customer service reps will be glad to offer assistance and guidance. Don’t wait, call or place an online order today!